The Mark of the Assassin 2003 publication. 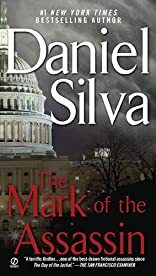 Bestselling novelist Daniel Silva (author of The Unlikely Spy) draws upon his experience as a foreign correspondent and a Washington journalist in The Mark of the Assassin. Set in London, Cairo, Amsterdam, and Washington, the story line follows CIA case agent Michael Osbourne as he attempts to locate the terrorists who shot down an airliner off the coast of Long Island. Osbourne has two main antagonists: Delaroche, a KGB-trained expert assassin ordered to kill the handful of people who know the truth, including Osbourne, and the corrupt political culture of Washington, which ominously stymies him at every turn. There's a love story at the core of this book, as well as a brave attempt by Osbourne to reconcile a mystery in his past with a present he has not fully accepted. The prose is slick, and readers will find themselves racing through these pages as the body count grows and the conclusion nears. The Mark of the Assassin is a worthy effort from a rising star. 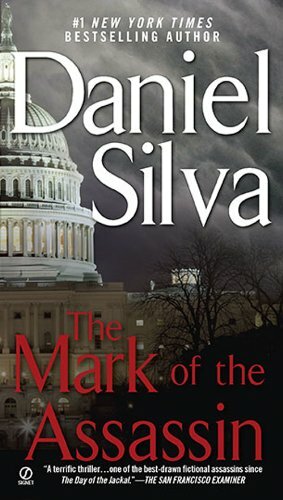 About Daniel Silva (Author) : Daniel Silva is a published author. Some of the published credits of Daniel Silva include The Mark of the Assassin, The Unlikely Spy, The Kill Artist, and The English Assassin.